Refusing to be defined as ‘other’ and ‘non-traditional’, the Service Project for Transgender People and Their Close Ones T9 NSK’s campaigns subvert the typical ‘tradition’ narrative often used to suppress LGBT people. 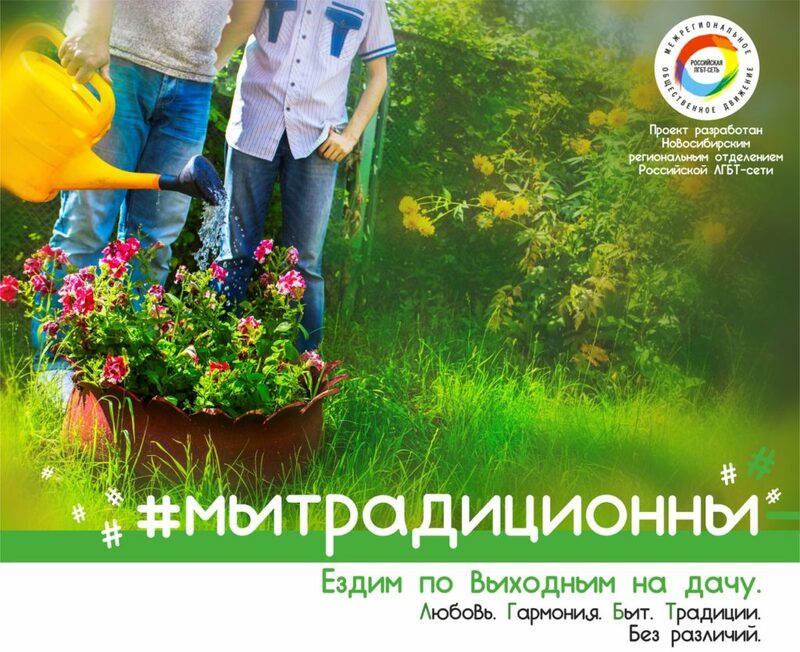 A project of both T9 NSK and the Russian LGBT Network, the campaign is titled We Are Traditional. 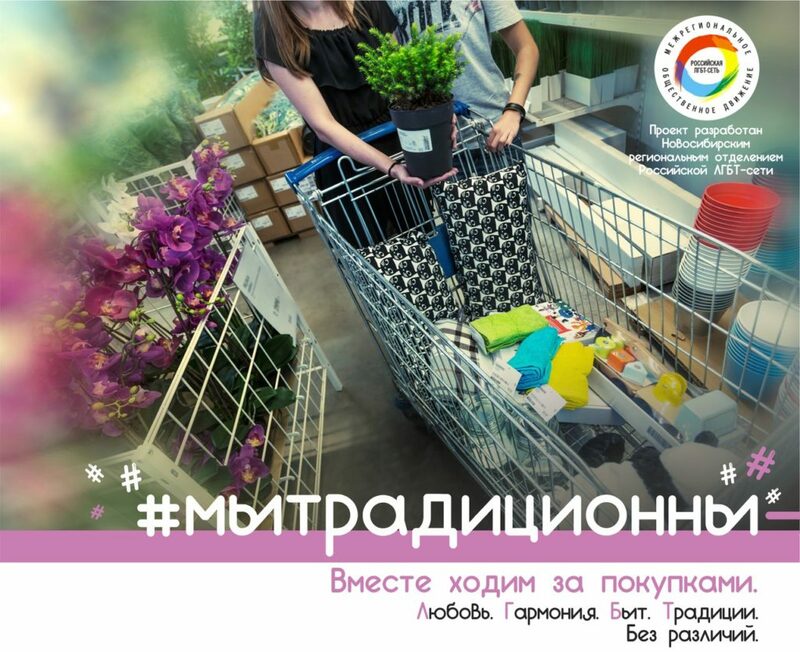 This campaign takes the current Russian understanding for the word ‘queer’ as ‘non-traditional’ and counters it through a series of photographs depicting LGBT people doing ‘traditional’ practices such as shopping together, caring for each other, and having fun together. 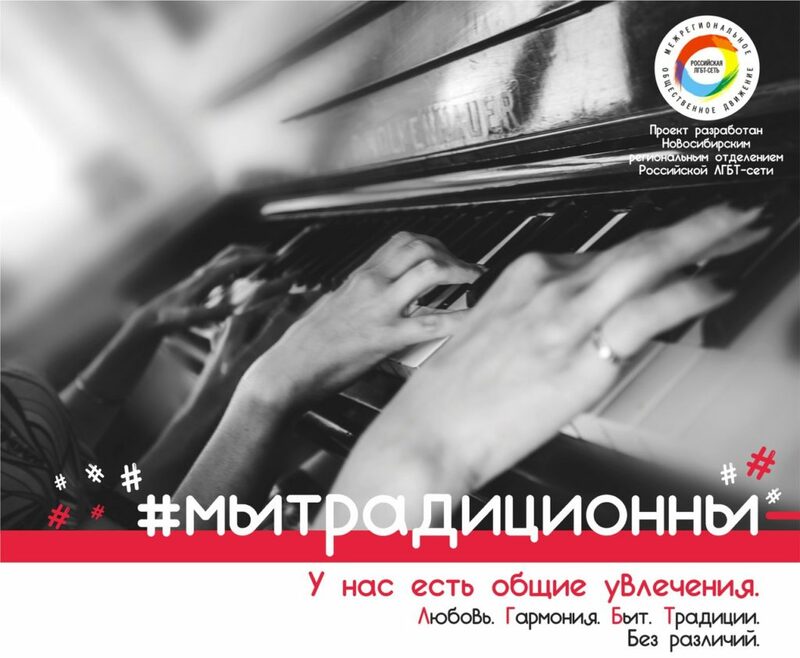 Natalia Soloviova and Elena Aab, from the organisation “T9 NSK” from Novosibirsk, tell us the story of how their campaign spoke to the hearts, before aiming at the minds. Your campaign was titled « We are traditional ». Seriously ??? So how are you “traditional”? It’s the values that make us traditional. We share the same values as many other people in Russian society. We wanted to show this so it would not only show our target group that we are similar to them, but we would also appeal to these values in our target group in order to change their attitudes towards people with diverse sexual orientations and gender identities. You said “target group”. Who are they? We essentially aimed at people who were already rather sympathetic towards LGBT people, like people who knew someone who was LGBT, people who knew what the acronym means. Not the closest circle of supporters, but the next one. We definitely ignored the LGBTphobic people. We also aimed at LGBT people themselves, because internalised stigma is so strong here that most LGBT people see themselves as inherently abnormal. This campaign was also done to deconstruct this and to tell everybody that they are also “normal”, in their own special way. So you focused on values. Which ones exactly? We took the acronym LGBT to spell them out ! We also tried to capture the spirit of the campaign in its name/slogan. The slogan plays an essential part in the success of a campaign. A good slogan catches people’s attention and imagination. It took us days of brainstorming and glazing at the ceiling before we came up with the name “Bez razlichy”, which means “without difference”. Who developed the campaign material? Was it tested? Luckily Elena is a professional photographer and we have good designer friends. We developed 19 proposals and tested them is a small focus group with some activists, some non-activist LGBT people and some friends. We discussed what people liked or not, how they understood the images and the texts, how they made them feel. With the results, we decided to keep 13. Incidentally, this testing also surfaced that people really enjoyed having the visuals printed out a postcards, which are very popular with people here in Siberia. Some people in the movement resisted the message that we were “traditional” as they protested that it was “normalising” and disregarding the queerness of LGBT identities. But we did our pedagogical homework and explained that the message was not meant for us, but for our target group. This is often a difficult moment for a campaign because you spend time trying to convince your own community, when time should be spent on convincing others. But it’s a necessary step. If anything, these reactions showed us that we needed to pay more attention to the issue of internalised stigma, and we have since then factored this into our other programs. Also, this negative reaction was from about 20% of the community. Considering that any campaign has to be somewhat provocative if it wants to succeed, it’s not a bad thing that it generated opposition. Nothing is worse than indifference. How do you assess outcomes? Like everyone else, with “vanity” indicators like number of posts mentioning the campaign (400), number of shares, of likes (2500), etc. We wanted to engage in a deeper evaluation of the changes that this campaign actually produced, but this would take resources we don’t have. People in our communities suffer a lot. As a result of this, they are extremely sensitive, and are easily triggered. It is important to spend whatever time is needed to explain the campaign strategy to them. Sometimes it is not easy for everyone to understand that we have to meet the target audience where they are at, even if that “place” is not somewhere where we like to be. A good name or slogan is essential. Take whatever time it takes, but come up with something inspiring, that will “hook” people instantly. Researching the impact of a campaign on attitudes is a terribly difficult thing unless you have a very strict protocol and can measure attitudes over a large period of time. Organisations very rarely have this. So an alternative is to invest heavily in the conception phase of a campaign and determine clearly at that stage how the campaign impacts the focus groups, or a small sample of the target group. These observations can tell more about the impact of a campaign than a heavy ex-post evaluation. These would be quite artificial anyway, as people get influenced by many other factors besides the campaign. People are driven by emotions. Campaign must aim for the hearts before aiming for the minds.